SAN SALVADOR, El Savlador (CNS) — Salvadorans plan to walk more than 90 miles in three days to mark the centennial of Blessed Oscar Romero’s birth. 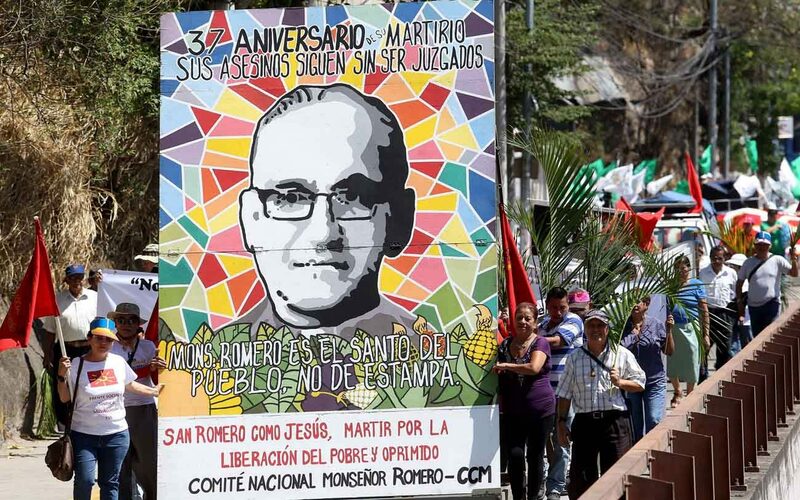 Participants will leave the Metropolitan Cathedral in San Salvador Aug. 11 and are scheduled to arrive in Ciudad Barrios, the eastern city where Blessed Romero was born, Aug. 13. The pilgrimage, “Caminando hacia la cuna del Profeta” (“Walking toward the prophet’s birthplace”), will go through four dioceses — San Salvador, San Vicente, Santiago de Maria and San Miguel. Blessed Romero was born Aug. 15, 1917, and the actual centennial will be marked by a Mass at San Salvador’s cathedral. Chilean Cardinal Ricardo Ezzatti of Santiago, Pope Francis’ special envoy to the celebration, will be the main celebrant. Masses also are scheduled in other parts of the country. On Aug. 12, in the western Santa Ana Diocese, Archbishop Leon Kalenga Badikebele, apostolic nuncio to El Salvador, will deliver the homily at a commemorative Mass, while Salvadoran Cardinal Gregorio Rosa Chavez, a close friend of Blessed Romero, is scheduled to give a presentation on the archbishop’s life and work. Ordained April 4, 1942, in Rome, the Salvadoran religious leader was appointed archbishop of San Salvador Feb. 23, 1997, and was gunned down after Mass at a hospital chapel March 24, 1980, a day after a sermon in which he called on Salvadoran soldiers to obey what he described as God’s order and stop carrying actions of repression. The archbishop’s March 30 funeral at the cathedral, attended by more than 200,000 mourners, was interrupted by gunfire that left 30-50 people dead.